The banter of the feisty sisters from northern England belies an intellectual rigor and distinctive vision behind their art. Issues of identity and marginalization occupied their focus early on; their 1995 film Normapaths, for instance, which featured stunt doubles of the twins walking through fire and breaking down doors, played up the uncanny aspects of twinness. Their interest would later shift to deserted architectural spaces bearing the residues of state power, such as the Russian cosmonaut training facility at Star City, the subject of a four-channel video installation that premiered at New York’s 303 Gallery in 2000. In these works, which have a much weightier feel, the twins are, for the most part, absent or figure only as shadowy apparitions. 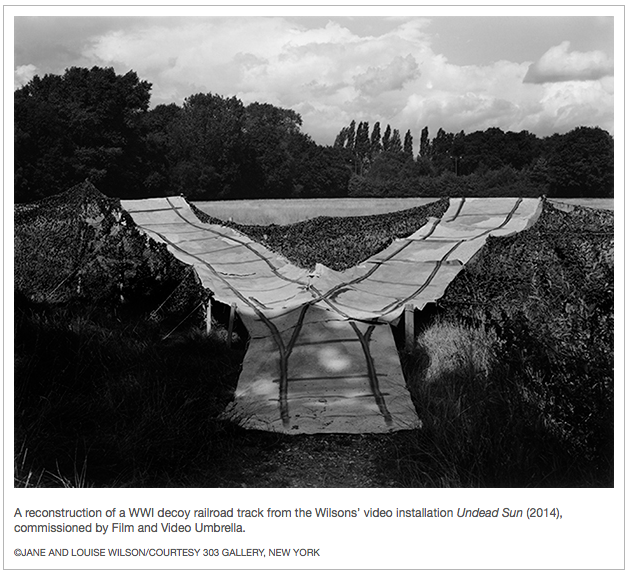 Such historical and psychological excavations via film and photography have become the Wilsons’ trademark. The sisters often present their still and moving pictures within immersive, large-scale installations incorporating multiple screens and sculptural elements, enhancing viewers’ feelings of claustrophobia and unease. “Their work is uncomfortable because it’s about memory and places, about loss and abandoned spaces,” says Isabel Carlos, director of the Calouste Gulbenkian Foundation Center of Modern Art in Portugal, who curated “Suspended Time,” the Wilsons’ exhibition there in 2010. The fact that the sisters often delve into episodes in countries’ histories that their citizens would rather forget compounds that sense of discomfort. Since receiving their master’s degrees from Goldsmiths College, London, in 1992, the pair has exhibited across Europe, America, Japan, and the Middle East, and have been included in such international group shows as “Out of Time” at the Museum of Modern Art in New York, the 1999–2000 Carnegie International in Pittsburgh, and “Moving Pictures” at the Guggenheim in Bilbao. Tate Modern is currently showing their otherworldly photographs of Nazi bunkers erected along the Normandy coastline in the group exhibition “Conflict, Time, Photography” that runs through March 15. Also on view until mid-January at London’s newly revamped Imperial War Museum is the Wilsons’ video installation Undead Sun (2014), commissioned by Film and Video Umbrella to mark the World War I centenary. Avoiding familiar depictions of trench warfare and fighter-jet battles, the work instead shines a light on early decoy and surveillance techniques that developed as the sky became a combat zone. “Suddenly you could be spotted from the air. Moving up into the sky is what defines modern warfare; it’s the beginning of aerial photography and surveillance and drone technology,” says Jane. The Wilsons re-created curiosities they found in the war museum’s archival footage—a dummy horse’s carcass used by snipers, the wooden skeleton of a decoy tank, early prosthetic facial parts—and reconstructed scenes of women camoufleurs sewing khaki netting and molding decoy heads. These arresting images are set against the backdrop of a gigantic disused wind tunnel, which serves as a metaphor for the passage of time, its huge blades propelling mankind backward and forward between past to present. The film closes with the stark image, based on a true incident, of a conscientious objector ripping his uniform to shreds and arraying it on a barbed-wire fence before walking off into the night, naked. “For us it’s important that there is this element of an individual’s protest against war,” Louise notes. As twins, the Wilsons have a heightened sense of individuality. Born in Newcastle upon Tyne in 1967, they were put in separate classes at school so they would not be forced to compete with each other. Their father was a naval architect, their mother a school secretary. The sisters trace their interest in snooping around buildings to weekends spent at their grandmother’s house, which had no television but nooks galore. They came of age as Margaret Thatcher’s government was closing down mines, shipyards, and steel plants in the north of England. “It was brutally draconian and totally depressing. You couldn’t help but get politicized,” says Jane. The political climate abroad in the last decades of the Cold War also fed into their later work. The Wilsons did their undergraduate studies separately (Louise at Duncan of Jordanstone College of Art and Design, Jane at Newcastle Polytechnic), but for their degree shows, they presented identical photographs of a staged double suicide in their parents’ garage. From that moment, they say, collaboration was inevitable. Graduating from Goldsmiths at a time when the Young British Artists’ phenomenon was in full swing, the sisters were included in several YBA shows, perhaps because their work of the time was seen to share the self-aware tone and gothic sensibilities of other members of the group. For instance, their playful 1995 film Crawl Space, in which the camera prowls around a building whose peeling walls pulsate and drip blood, quotes horror-movie classics. In Hypnotic Suggestion 505 (1993) they filmed themselves identically dressed, yielding their conscious will to a male hypnotist. A performative element has always pervaded the Wilsons’ work, whether they are on camera or staging participatory installations. Sharing a studio apartment in the red-light district of King’s Cross in the early ’90s, they incorporated their seedy surroundings into films and photographs evoking menacing domestic scenes. Life and art merged bizarrely when a man tried to smash down their door and two weeks later left an apologetic note explaining he had a psychiatric illness. Naturally the note materialized in a series of photographs called “Construction and Note” (1992). 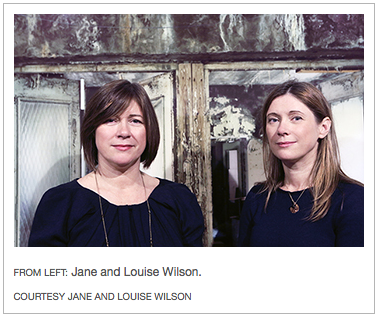 The Wilsons won the Barclays Young Artist Award in 1993, which broadened their profile and brought welcome cash. But their real break came with the award three years later of a German government scholarship in Berlin. Until that point they had set their work in alienated spaces such as bordellos and motels, but in Berlin tangible traces of history confronted them everywhere. “It became so apparent you were living somewhere where architecture wasn’t something that was neutral,” says Jane. 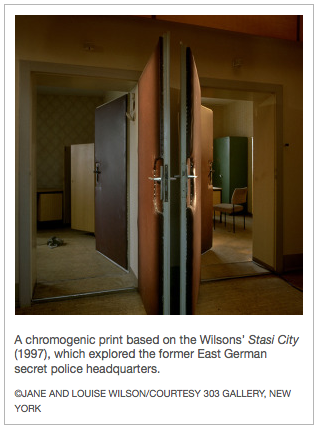 Their 1997 film Stasi City, documenting the labyrinthine headquarters of the East German secret police, marked a seismic shift into a more politically engaged art. In installations presenting the film, they re-created the interrogation rooms of the Stasi prison with their padded doors and paper-thin walls so viewers could physically experience the theater of the regime’s intimidation techniques. “Their work is very dramatic and often sinister, but most of all very powerful. It combines the personal, the political, and the poetic,” says Britain-based art patron Delfina Entrecanales, whose Delfina Studio Trust offered a lifeline to some 400 artists, including the Wilsons, between 1988 and 2006. Given the Wilsons’ interest in the physical remnants of state power, it is perhaps not surprising that after Stasi City, they turned their attention to Greenham Common, site of violent battles between female anti-nuclear protesters and British police. Gamma (1999), their film of the disarmed base, earned the sisters a Turner Prize nomination and was shown at London’s Serpentine Gallery in 1999. Chernobyl, the site of what is still the worst nuclear-power-plant accident in history, proved similarly alluring. But as is characteristic of the way they work, the artists approached the subject obliquely, eschewing the obvious. 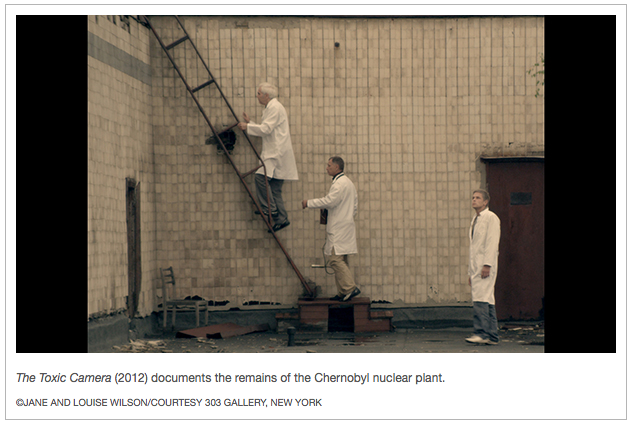 Rather than the plant itself, their haunting film The Toxic Camera (2012) takes as its starting point Vladimir Shevchenko’s camera, which was used by the Ukrainian filmmaker to document the aftermath of the 1986 explosion and which itself became radioactive. “It seemed that there was a much more interesting narrative around this artifact, the camera, which is of course all about the act of looking and documenting and dark tourism,” says Louise. Likewise, their photographic series “Atomgrad (Nature Abhors a Vacuum),” 2010, examines the deserted Soviet showcase town of Pripyat, built for Chernobyl workers, eloquently conjuring the shattered Communist dream in images of the town’s derelict swimming pool, abandoned amphitheater, and empty classrooms. In a new departure, the Wilsons recently began to create collages by superimposing images of yardsticks onto their own and archival photographs of Pripyat. Yardsticks have featured in the artists’ sculptural work since 2009, functioning as markers of scale, Duchampian readymades, and monuments to obsolescence—the yard being an outdated standard of British measurement. Photographed in situ at nuclear testing sites or power stations, they allude to the unreliability of official measures of radioactivity. “I’m very interested in these black-and-white collages, which are incredibly successful and which explore the same territory—the abandoned laboratories, architectural spaces that have some sinister resonance—but on a smaller scale using a different technique,” says Ann Gallagher, head of British art collections at Tate Britain, who has followed the Wilsons since curating them in a British group show at the 1995 Venice Biennale. “Jane and Louise carve out a utopian space in places that others would regard as failures,” says Maria Balshaw, director of the Whitworth Art Gallery in Manchester, which hosted a survey show of the sisters’ work in 2012. She highlights the Wilsons’ “steely feminism” that is never explicit but underpins their dissection of patriarchal structures.